Welcome to Forsaken World’s latest expansion, Homecoming! After many months of hard and bloody battle, we have finally turned the tire on Storm Legion, reclaiming The Sanctuary and Dusk Town as we march toward Freedom Harbor! 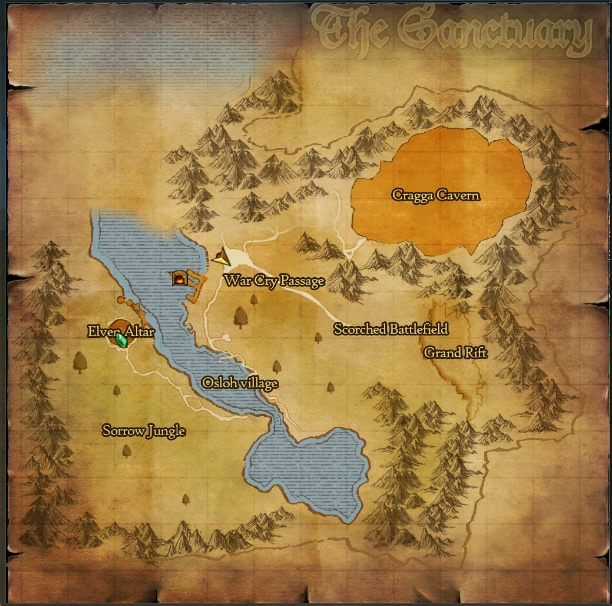 To enter The Sanctuary, you will need to have reached level 95. Simply find the Vengeance Promoter in Nightfall Citadel [Nightfall Citadel -6 -13, -5 -15] and talk to him. Select the “Sanctuary Retake [Level 95]” option and he will teleport you into Sanctuary. Once there talk to the Bard Antinoa and she will begin your series of quests to be completed in Sanctuary. 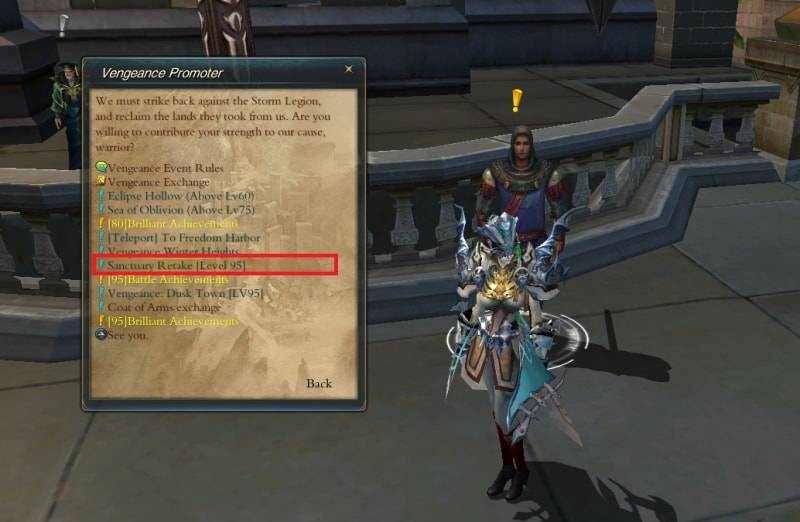 Quests and NPC’s will be scattered throughout the map, and their tasks will vary from anything like Killing Storm Legion Spies to collecting Keys to free imprisoned elves. The tasks you will need to complete will change from day to day, as well as which NPC’s that need your help. Despite the day’s tasks, check in with Antinoa and she will befuddle you with one of the mind-bendingly difficult “God’s Puzzles” The puzzle differs each day and consists of a riddle in which you must decipher the correct 5 digit code by selecting each of the five statues next to the Sanctuary altar in the correct order. After completing the daily quests in the Sanctuary, you will be given the opportunity to kill a Storm Legion Commander. 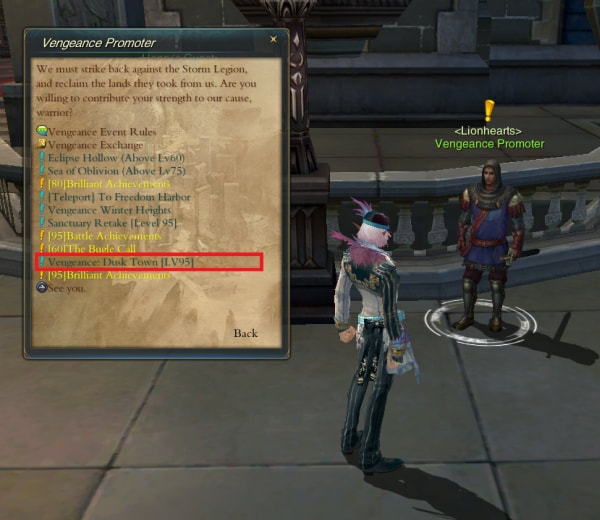 Kill the commander and you will be rewarded with Sanctuary Reputation and precious items. To enter Dusk Town, you will need to have reached level 95. Simply find the Vengeance Promoter in Nightfall Citadel [Nightfall Citadel -6 -13, -5 -15] and talk to him. Select the “Vengeance: Dusk Town [LV95]” option and he will teleport you into Dusk Town. Once you have arrived in Dusk Town, find Dragos at the top of the Stairs and he will guide you on your quests to help the Kindred retake their homeland. 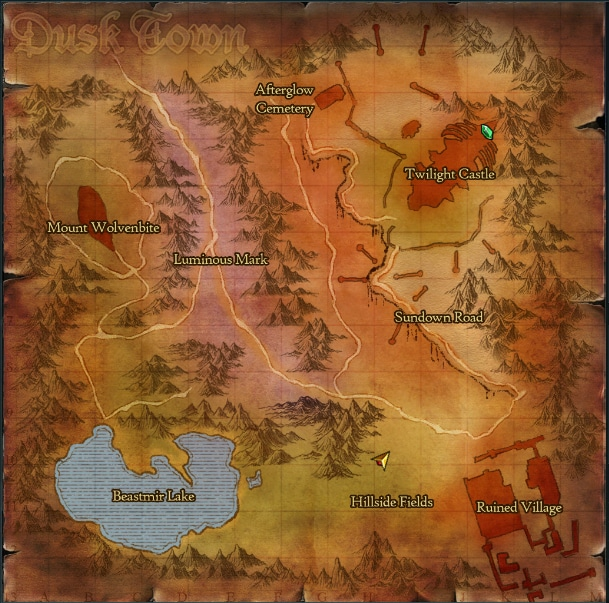 Quests and NPC’s will be scattered throughout the map, and their tasks will vary from anything like curing Kindred soldiers who have become infected by magic to killing the swarms of Steelwing Demons or finding wounded Kindred hiding in the dark corners of the Ruined Villiage. The tasks you will need to complete will change from day to day, as well as which NPC’s that need your help. 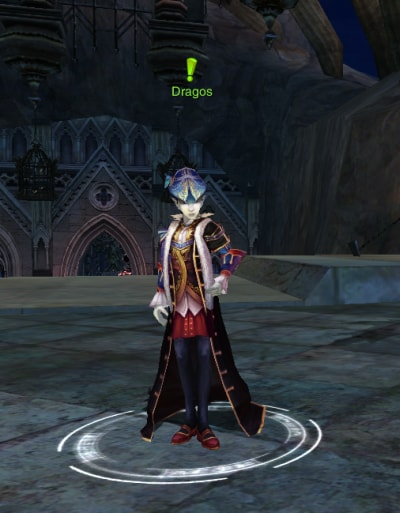 Once you have completed your daily tasks in Dusk Town, Dragos will be waiting with rewards and reputation to thank you for helping the Kindred retake their ancestral homelands. We hope this quick guide gave you some pointers on how to get started retaking your homelands! Be sure to take a look at some of the other how-to’s if you get stumped or need a push in the right direction. Good luck adventurers!